Arsene Wenger yesterday confirmed the worst kept secret at Arsenal that Thierry Henry would return to the club as cover for Robin van Persie. The six week deal has been struck to provide cover for the Dutchman while Marouane Chamakh and Gervinho are away at the Africa Cup of Nations. Henry can play against Fulham on Monday provided the relevant paperwork is submitted to the FA and Premier League. 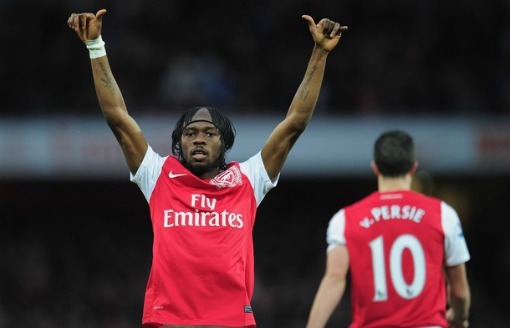 But Wenger has said the French striker is two weeks away from making a full return. Personally I don't think we've got time to wait for that period of double training sessions to be completed. We need a player who is ready now and I expect Henry to be back in a red and white shirt prior to Wenger's two week prediction, even taking a place on the bench on Monday. The initial loan deal runs out after our Champions League away leg game with AC Milan on February 15. There is an option to extend it for a further 11 days to make Henry's last game on loan with us the match at the Grove against Spurs. How fitting it would be if he scored the winning goal against them in his final match before heading back to New York. The manager has explained his thinking behind the deal and said he knew on Henry's first day of training at London Colney back on November 17 that he'd make a move to re-sign Arsenal's leading record goal scorer. "I knew that we needed a short-term solution and [I knew] that he has the quality and capacity to help us out. You do not find players on the planet of this quality who are available for two months." The question I would ask is whether it is just for two months we need someone. Henry is an ideal option whilst Gervinho and Chamakh are away, but with Wenger having little option up front other than van Persie, I hope this doesn't kill off any potential moves for other strikers we could make during January. We all know Henry won't be the same player we last saw in 2007. And Wenger has stressed he's still got the attributes we need and that's why he's decided to bring him back to north London. "Nobody expects him to be what he was 10 years ago — we just want him to help out. "I think it is credit to him to want to help a club that has given him so much. Therefore I feel there is no pressure to be the player he was before. "You can never take away from people what they have done, that will remain for ever. The same with Thierry. It's just that we need a short-term solution." There has been talk of this move threatening Henry's legacy. And that is something which Bob Wilson doesn't think will be tarnished even if this loan spell doesn't go as well as everyone hopes it will. I think it's a case of waiting and seeing with our own eyes what Henry can offer. He's obviously impressed Wenger in training enough to be offered the chance to return and I would suggest that our manager is a good judge of a player. We must remember that Robin van Persie is still the main man. Henry is purely cover for a player who is closing in on Alan Shearer's 36 calendar year goal scoring record. Two goals this afternoon will equal that record and a hat-trick will break it. The team news is just how we thought it would be. There are no new injuries following the Wolves game and Theo Walcott is back in the squad following his illness. I would expect Wenger to revert to his strongest available 11. The manager may make a couple of changes with the Fulham game coming up on Monday. One player who won't be back in the team any time soon is Abou Diaby, who the manager can't put a time scale to a return on. Elsewhere the BBC report that Emmanuel Frimpong will head to Wolves on loan until the end of the season, despite late interest in the midfielder from QPR and Aston Villa. I think it's a good move for the player. He needs to get more games under his belt and I have no doubt that he'll come back to us a stronger player following this loan deal. We need to return to winning ways following our frustrating draw against Wolves. With Liverpool winning last night against Newcastle we drop to fifth position in the league. But if we win, we'll go above them again and if Aston Villa can take anything from Chelsea and we take maximum points later, we'll go fourth. I hope the buzz created by Henry returning can inspire us to victory. And what better way to do that would be with a Robin van Persie hat-trick. Where ever you are watching the game enjoy it.